Learn how to use Microsoft's System Center Data Protection Manager's System Recovery Tool to recover a failed server in this tip. What you will learn in this tip: Learn how to install and use Data Protection Manager's System Recovery Tool to restore failed servers. Reset the failed computer's account in the Active Directory. Repair any hardware problems that may exist on the failed computer. Install Windows and any previously used service packs onto the failed computer. You must use the same operating system version and service pack level as was previously used. Configure the server to use the same computer name as it previously used. Join the computer to the Active Directory. Use Data Protection Manager to deploy a protection agent to the computer. As you can see, Data Protection Manager's dependence on the Active Directory means that you have to do quite a bit of work before you can even begin restoring your data. But it doesn't have to be that way. Microsoft offers a tool for Data Protection Manager called the System Recovery Tool. You can use the DPM System Recovery Tool to facilitate bare-metal restores of failed servers. 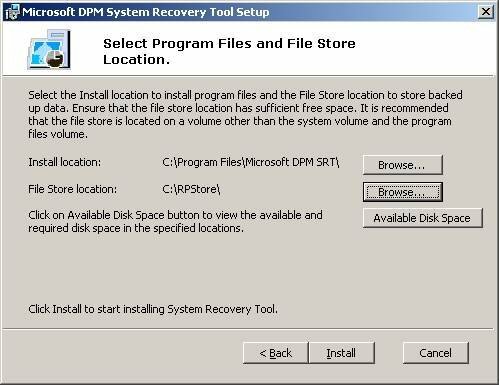 The System Recovery Tool isn't included on the DPM 2007 installation DVD, but it can be found on the DPM System Recovery Tool DVD. There is also a common misconception surrounding the System Recovery Tool. Some administrators assume that the System Recovery Tool was a boot disk that connects a failed server to the Data Protection Manager Server so that data can be recovered. That's only partially true. You can't wait for disaster to strike and then use the System Recovery Tool to perform a bare-metal installation. You have to do some advanced planning to prepare for a disaster. While the System Recovery Tool does include a boot disk for the failed system, there's also a component that must be installed on a Data Protection Manager server. The first step is to install the System Recovery Tool. Microsoft recommends installing the System Recovery Tool on a server other than your primary Data Protection Manager server. However, in small-scale deployments with no more than five computers, you can get away with deploying the System Recovery Tool directly on the Data Protection Manager server. In either case, you should dedicate a disk (or a storage array) entirely to the System Recovery Tool. As shown in Figure 1 below, the System Recovery Tool requires that you install a set of binaries, but it also requires a file storage location. The location that you specify will store disk layout information for the protected computers, as well as a copy of each machine's system volume. Incidentally, single instance storage helps to reduce the amount of space required by the system volume copies. When the installation process completes, the System Recovery Tool will have created two new desktop icons, as shown in Figure 2 below. The first icon is for the Recovery Scheduler, a tool that allows you to schedule the creation of recovery points that can be used by the System Recovery Tool. 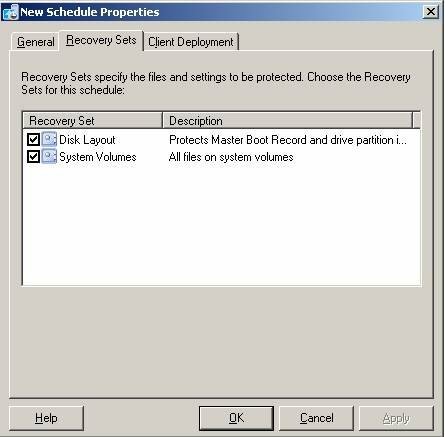 You must run the Recovery Scheduler before you can perform any other actions with the System Recovery Tool. The other icon is for the Recovery Center. The Recovery Center is the interface that you will use to roll a protected system back to a previous recovery point when a failure occurs. 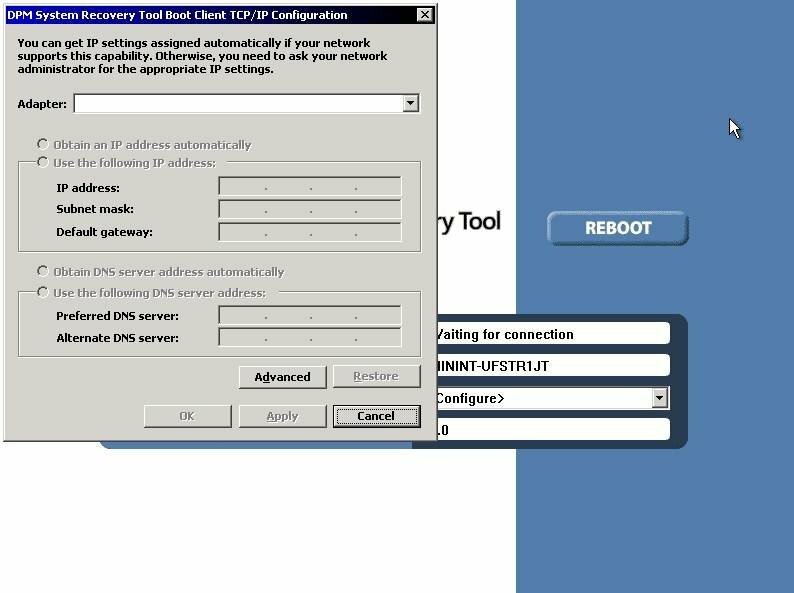 Figure 3 below shows that the Recovery Center provides an option to create a boot client. A boot client is the boot disk from which you can boot a failed server. Technically, the boot client isn't machine specific. You can create a single boot client and use it for all of your protected servers. However, the boot client won't work unless it has drivers for the protected machine's storage devices and network adapters. Therefore, if your servers contain dissimilar hardware then you may have to create multiple boot clients. When you boot a failed machine from a boot client, the first thing that you will see is a Windows XP splash screen, then the screen shown in Figure 4 below will appear. 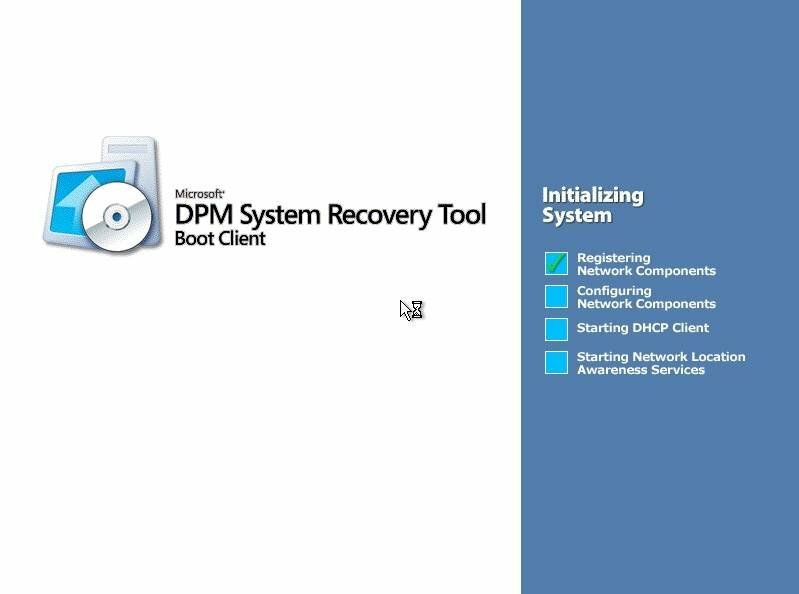 The boot client will display this screen as the System Recovery Tool loads the various drivers and services required by the recovery process. Once the necessary components have been loaded, you are asked to provide TCP/IP information for the failed machine, as shown in Figure 5 below. After doing so, the failed computer will establish connectivity with the server containing the recovery information. 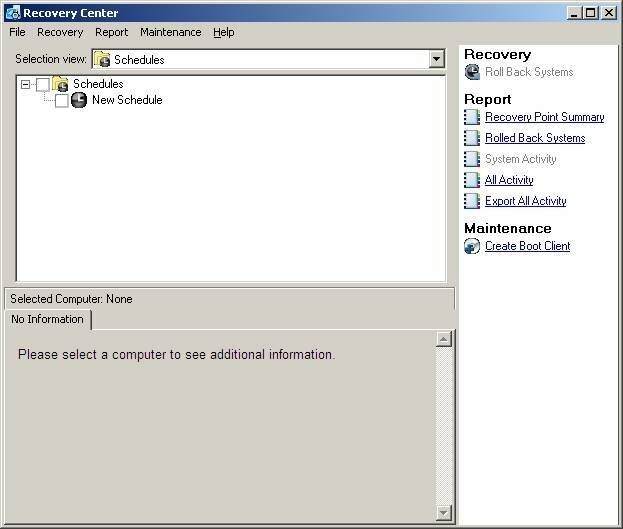 You may then use the Recovery Center to choose a recovery point to be restored. When you do, the actual recovery process will begin. DPM's System Recovery Tool is a handy utility that makes bare-metal restore possible. But it's important to know that you must set up the System Recovery Tool before a failure occurs, or it will do you no good.